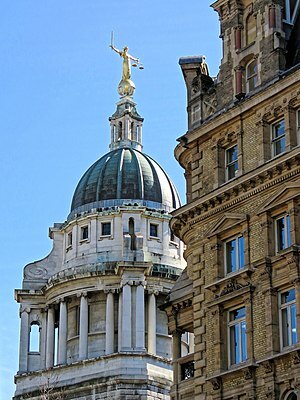 The Old Bailey, set on the old fortifications of the London wall, hears Crown Court trials for London. The statute of Lady Justice is meant to symbolise fairness and impartiality. English criminal law concerns offences, their prevention and the consequences, in England and Wales. Criminal conduct is considered to be a wrong against the whole of a community, rather than just the private individuals affected. 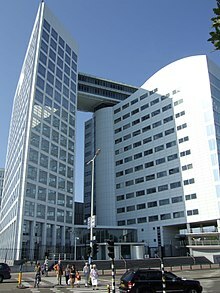 The state, in addition to certain international organisations, has responsibility for crime prevention, for bringing the culprits to justice, and for dealing with convicted offenders. The police, the criminal courts and prisons are all publicly funded services, though the main focus of criminal law concerns the role of the courts, how they apply criminal statutes and common law, and why some forms of behaviour are considered criminal. The fundamentals of a crime are a guilty act (or actus reus) and a guilty mental state (or mens rea). The traditional view is that moral culpability requires that a defendant should have recognised or intended that they were acting wrongly, although in modern regulation a large number of offences relating to road traffic, environmental damage, financial services and corporations, create strict liability that can be proven simply by the guilty act. Defences exist to some crimes. A person who is accused may in certain circumstances plead they are insane and did not understand what they were doing, that they were not in control of their bodies, they were intoxicated, mistaken about what they were doing, acted in self defence, acted under duress or out of necessity, or were provoked. These are issues to be raised at trial, for which there are detailed rules of evidence and procedure to be followed. England and Wales does not have a Criminal Code, though such an enactment has been often recommended and attempted (see English Criminal Code). Many criminal offences are common law offences rather being specified in legislation. In 1980, a Committee of JUSTICE said that, upon conducting a search, they found over 7,200 offences, and that they thought that there were probably many more. They said that "it is now impossible to ascertain the entire content of the criminal law at any given time". In 1989, the Law Commission said that a hypothetical criminal code that contained all existing criminal offences would be "impossibly bulky". In 2001, Peter Glazebrook said the criminal law was "voluminous, chaotic and contradictory". In March 2011, there were more than ten thousand offences excluding those created by by-laws. In 1999, P J Richardson said that as the case for a moratorium on legislation in the field of criminal justice was becoming stronger and stronger, governments seemed ever more determined to bring forward more legislation. The two basic elements of a crime are the act of doing that which is criminal, and the intention to carry it out. In Latin this is called the actus reus and the mens rea. In many crimes however, there is no necessity of showing criminal intention, which is why the term "strict liability" is used. Furthermore, one can become bound by a duty to take reasonable steps to correct a dangerous situation that one creates. In R v Miller a squatter flicked away a still lit cigarette, which landed on a mattress. He failed to take action, and after the building had burned down, he was convicted of arson. He failed to correct the dangerous situation he created, as he was duty bound to do. In many countries in Europe and North America, Good Samaritan laws also exist, which criminalize failure to help someone in distress (e.g. a drowning child). On the other hand, it was held in the U.K. that switching off the life support of someone in a persistent vegetative state is an omission to act and not criminal. Since discontinuation of power is not a voluntary act, not grossly negligent, and is in the patient's best interests, no crime takes place. If someone's act is to have any consequence legally, it must have in some way caused a victim harm. The legal definition of "causation" is that "but for" the defendant's conduct, the victim would not have been harmed. If more than one cause for harm exists (e.g. harm comes at the hands of more than one culprit) the rule states that to be responsible, one's actions must have "more than a slight or trifling link" to the harm. Another important rule of causation is that one must "take his victim as he finds him." For instance, if P gives his friend Q a playful slap on the head, but Q suffers from a rare cranial condition and dies, then P can be guilty of manslaughter regardless of how unlucky he is to have bickered with Q. This is known as the thin skull rule. Between the defendant's acts and the victim's harm, the chain of causation must be unbroken. It could be broken by the intervening act (novus actus interveniens) of a third party, the victim's own conduct, or another unpredictable event. A mistake in medical treatment usually will not break the chain, unless the mistakes are in themselves "so potent in causing death." For instance, if emergency medics dropped a stab victim on the way to the hospital and performed the wrong resuscitation, the attacker would not be absolved of the crime. The interplay between causation and criminal responsibility is notoriously difficult, and many outcomes are criticized for their harshness to the unwitting defendant and sidestepping of hospitals' or the victim's own liability. In R v Dear a stab victim reopened his wounds while in the hospital and died. But despite this suicidal behavior, the attacker was still held fully responsible for murder. Mens rea is another Latin phrase, meaning "guilty mind". It is the mental element of committing a crime and establishes the element of intent. Together with an actus reus, mens rea forms the bedrock of criminal law, although strict liability offenses have encroached on this notion. A guilty mind means intending to do that which harms someone. Intention under criminal law is separate from a person's motive. R v Mohan  2 All ER 193, intention defined as "a decision to bring about... [the actus reus] no matter whether the accused desired that consequence of his act or not." In the special case of murder, the defendant must have appreciated (i.e. consciously recognized) that either death or serious bodily harm would be the result of his actions. In R v Woolin, a man in a fit of temper threw his three-month-old son onto a wall, causing head injuries from which he died. Although death was certain and the father should have realized, he did not in the least desire that his son be killed or harmed. The English House of Lords sentenced him for manslaughter, but not murder. If a defendant has foresight of death or serious injury the jury may, but is not bound to, find the requisite mens rea. A lower threshold of mens rea is satisfied when a defendant recognizes that some act is dangerous but decides to commit it anyway. This is recklessness. For instance if C tears a gas meter from a wall to get the money inside, and knows this will let flammable gas escape into a neighbor's house, he could be liable for poisoning. This is called "subjective recklessness," though in some jurisdictions "objective recklessness" qualifies as the requisite criminal intent, so that if someone ought to have recognized a risk and nevertheless proceeded, he may be held criminally liable. A novel aspect of the law on intention is that if one intends to harm somebody, it matters not who is actually harmed through the defendant's actions. The doctrine of transferred malice means, for instance, that if a man strikes another with his belt, but the belt bounces off and hits a nearby woman, the man is guilty of battery toward her. Malice can also be general, so that terrorists who plant bombs to kill random people are certainly guilty. The final requirement states that both an actus reus and a mens rea coincide. For instance, in R v Church, For instance, Mr. Church had a fight with a woman which rendered her unconscious. He attempted to revive her, but gave up, believing her to be dead. He threw her, still alive, in a nearby river, where she drowned. The court held that Mr. Church was not guilty of murder (because he did not ever desire to kill her), but was guilty of manslaughter. The "chain of events", his act of throwing her into the water and his desire to hit her, coincided. In this manner, it does not matter when a guilty mind and act coincide, as long as at some point they do. Not all crimes have a mens rea requirement, or the threshold of culpability required may be reduced. For example, it might be sufficient to show that a defendant acted negligently, rather than intentionally or recklessly. In offences of absolute liability, other than the prohibited act, it may not be necessary to show anything at all, even if the defendant would not normally be perceived to be at fault. England and Wales has strict liability offences, which criminalize behavior without the need to show a criminal mens rea. Most strict liability offences are created by statute, and often they are the result of ambiguous drafting. They are usually regulatory in nature, where the result of breach could have particularly harmful results. An example is drunk driving. Serious torts and fatal injuries occur as a result of actions by company employees, have increasingly been subject to criminal sanctions. All torts committed by employees in the course of employment will attribute liability to their company even if acting wholly outside authority, so long as there is some temporal and close connection to work. It is also clear that acts by directors become acts of the company, as they are "the very ego and centre of the personality of the corporation." But despite strict liability in tort, civil remedies are in some instances insufficient to provide a deterrent to a company pursuing business practices that could seriously injure the life, health and environment of other people. Even with additional regulation by government bodies, such as the Health and Safety Executive or the Environment Agency, companies may still have a collective incentive to ignore the rules in the knowledge that the costs and likelihood of enforcement is weaker than potential profits. Criminal sanctions remain problematic, for instance if a company director had no intention to harm anyone, no mens rea, and managers in the corporate hierarchy had systems to prevent employees committing offences. One step toward reform is found in the Corporate Manslaughter and Corporate Homicide Act 2007. This creates a criminal offence for manslaughter, meaning a penal fine of up to 10 per cent of turnover against companies whose managers conduct business in a grossly negligent fashion, resulting in deaths. Without lifting the veil there remains, however, no personal liability for directors or employees acting in the course of employment, for corporate manslaughter or otherwise. The quality of a company's accountability to a broader public and the conscientiousness of its behaviour must rely also, in great measure, on its governance. Parts 1 to 3 of Schedule 3 to the Serious Crime Act 2007 list numerous statutory offences of assisting, encouraging, inciting, attempting or conspiring at the commission of various crimes. R v Morris; Anderton v Burnside  UKHL 1 meaning of "appropriates"
R v Hinks  UKHL 53 meaning of "appropriates"
Ivey v Genting Casinos (UK) Ltd  UKSC 67, Ivey was unable to claim £7.7m in winnings from the Genting Casinos because he had won by cheating, by ‘edge sorting’ with an accomplice, at a card game called Punto Banco. Supreme Court held the 'fact-finding tribunal' should establish a defendant's actual state of mind and then judge whether their conduct was honest or not according to the objective standards of ordinary decent people. Offences under the Misuse of Drugs Act 1971, the Intoxicating Substances (Supply) Act 1985, the Licensing Act 2003, section 7 of the Children and Young Persons Act 1933 and other provisions relating to tobacco, and the Drug Trafficking Act 1994. Offences under the Psychoactive Substances Act 2016. The defences which are available to any given offence depend on the wording of the statute and rules of the common law. There are general defences. Insanity, automatism, mistake and self defence operate as defences to any offence. Inadvertence due to intoxication is a defence to all offences requiring proof of basic intent if the intoxication is involuntary, and in cases where the risk would not have been obvious to a reasonable and sober person and/or the defendant, if it is voluntary, and to offences that require proof of a specific intent. Duress and necessity operate as a defence to all crimes except murder, attempted murder and some forms of treason. Marital coercion is a defence to all crimes except treason and murder. There are two main partial defences that reduce murder to manslaughter. 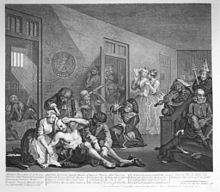 If one succeeds in being declared "not guilty by reason of insanity" then the result is going to an asylum, a clearly inadequate result for somebody suffering from occasional epileptic fits, and many conditions unrecognized by nineteenth century medicine. The law has therefore been reformed in many ways. One important reform, introduced in England and Wales by statute is the diminished responsibility defence. The requirements are usually more lax, for instance, being "an abnormality of mind" which "substantially impair[s] mental responsibility for his acts and omission in doing or being a party to the killing." Loss of control may be pleaded under sections 54 and 55 of the Coroners and Justice Act 2009. Infanticide now operates as a defence to both murder and manslaughter. See the Infanticide Act 1938 as amended by the Coroners and Justice Act 2009. Insanity is a deranged state of mind, and consequently no defence to strict liability crimes, where mens rea not is a requirement. An old case which lays down typical rules on insanity is M'Naghten's case where a man suffering extreme paranoia believed the Tory party of the United Kingdom, were persecuting him. He wanted to shoot and kill Prime Minister Sir Robert Peel, but got Peel's secretary in the back instead. Mr M'Naghten was found to be insane, and instead of prison, put in a mental hospital. The case produced the rules that a person is presumed to be sane and responsible, unless it is shown that (1) he was laboring under such a defect of reason (2) from disease of the mind (3) as not to know the nature and quality of the act he was doing, or if he did know it, that he did not know he was doing what was wrong. These elements must be proven present on the balance of probabilities. "Defect of reason" means much more than, for instance, absent mindedness making a lady walk from a supermarket without paying for a jar of mincemeat. A "disease of the mind" includes not just brain diseases, but any impairment "permanent or transient and intermittent" so long as it is not externally caused (e.g. by drugs) and it has some effect on one's mind. So epilepsy can count, as can an artery problem causing temporary loss of consciousness (and a man to attack his wife with a hammer). Diabetes may cause temporary "insanity" and even sleep walking has been deemed "insane". "Not knowing the nature or wrongness of an act" is the final threshold which confirms insanity as related to the act in question. In R v Windle a man helped his wife commit suicide by giving her a hundred aspirin. He was in fact mentally ill, but as he recognized what he did and that it was wrong by saying to police "I suppose they will hang me for this", he was found not insane and guilty of murder. Automatism is a state where the muscles act without any control by the mind, or with a lack of consciousness. A successful automatism defence negatives the actus reus element of a crime. If someone raises this defence, then it is for the prosecution to disprove. Automatismic actions can be a product of insanity, or not. One may suddenly fall ill, into a dream like state as a result of post traumatic stress, or even be "attacked by a swarm of bees" and go into an automatic spell. However to be classed as an "automaton" means there must have been a total destruction of voluntary control, which does not include a partial loss of consciousness as the result of driving for too long. Automatism can also be self-induced, particularly by taking medical treatment. Self-induced automatism can always be a defence to crimes of specific intent (such as murder, wounding or causing grievous bodily harm with intent, theft, robbery and burglary). But automatism is no defence to other crimes (i.e. of basic intent, e.g. manslaughter, assault and battery) if the defendant was reckless in becoming automatismic or it happens through alcohol or illegal drugs. Only where the defendant does not know his actions will lead to an automatismic state where he could harm something can self-induced automatism be a defence to these crimes. For example, in R v Hardie Mr Hardie took his girlfriend's Valium, because she had just kicked him out and he was depressed. She encouraged him to take them, to make him feel better. But he got angry and set fire to the wardrobe. It was held that he should not be convicted of arson because he expected the Valium to calm him down, and this was its normal effect. Technically, intoxication is not a defence, but negates the mens rea for specific intent offenses (e.g. it commutes a murder sentence to manslaughter). In other words, a defendant may have been so drunk, or drugged, that he was incapable of forming the criminal intention required. Voluntary intoxication is considered reckless, a state of basic intent, which means one cannot have ones sentence reduced for crimes of basic intent (e.g. manslaughter, assault, etc.). So for instance, in R v Sheehan and Moore two people threw petrol on a homeless person and set fire to him. They were cleared of murder, but were still convicted of manslaughter, since that is a crime of basic intent. Of course, it can well be the case that someone is not drunk enough to support any intoxication defence at all. On the other hand, if someone becomes involuntarily intoxicated, because his drink is laced or spiked, then the question is whether the normal mens rea was present at the incident's time. So where a blackmailer drugged a man's coffee, invited him to abuse a 15-year-old boy, and photographed it, the man was denied the defence of intoxication because the court simply did not believe that the man did not intend to commit the abuse. Sometimes intoxicated people make mistakes, as in R v Lipman where the defendant took LSD, thought his girlfriend was a snake and strangled her. Here, intoxication operated as a defence because Mr Lipman was mistaken in his specific intent of killing a snake. But intoxication does not negative the basic intent crime of manslaughter, with his "reckless course of conduct" in taking drugs. Lastly, while a mistake about a person or the actual action is acceptable, a mistake about how much force to use to defend oneself is not. Using a sledgehammer to fend off an "attacker" after 20 pints of beer is disproportionate. In all instances one may only use reasonable, and not excessive, force in self defence. In R v Clegg a soldier in Northern Ireland shouted at a car approaching a checkpoint to halt. When it did not, Mr Clegg fired three shots, killing a woman. She was hit in the back, and Mr Clegg was sentenced for murder because by then the car had passed, the force was excessive and there was no justification for self-defence. Another way of expressing the rule on defensive force is that it must be proportionate to the threat. For instance, as the notorious case of R v Martin shows, shooting a teenager in the back with a shotgun several times as he tries to escape is not a justified or proportionate exercise of self-defensive force for the Norfolk farmer, even if robbers had trespassed on his property. In that case, Mr Martin was found to have diminished responsibility for his actions, because he was mentally ill.
One who is "under duress" is forced into something. Duress can be a defence for all crimes, except murder, attempted murder, being an accessory to murder and treason involving the death of the Sovereign. In R v Howe it was held that to allow the defence of duress as a defence to murder would, in the words of Lord Hailsham, withdraw the protection of the criminal law from the innocent victim and cast the cloak of its protection upon the coward and the poltroon - ordinary people ought to be prepared to give up their lives to the person making the threat in preference to killing an innocent. R v Gotts, in a similar fashion, disallowed the defence of duress for someone charged with attempted murder, as the Lords could not see a reason why the defence should be open to an attempted murderer when it was not open to a murderer. In order to prove duress, it must be shown that the defendant was induced by threats of death or serious physical injury to either himself or his family that he reasonably believed would be carried out and that also that "a sober person of reasonable firmness, sharing the characteristics of the accused" would have responded in the same way. Examples of someone's characteristics that might be relevant are age, gender, pregnancy, physical disability, mental illness, sexuality, but not IQ. Using duress as a defence is limited in a number of ways. The accused must not have foregone some safe avenue of escape. The duress must have been an order to do something specific, so that one cannot be threatened with harm to repay money and then choose to rob a bank to repay it, because that choice implies free will. Intoxication is irrelevant to duress, but one cannot also say one is mistaken about duress, when intoxicated. Then a number of cases turn on the choice to join a gang, and inevitably do bad things. The rule is that where one is aware of the gang's nature and puts himself in a position where he could be threatened, duress is not a defence - joining a gang that carries out armed robberies probably precludes any duress defence but joining a gang that is not violent at the time of joining may not. Whilst a duress defence relates to the situation where a person commits an offense to avoid death or serious injury to himself or another when threatened by a third party, the defence of necessity related to the situation where a person commits an offense to avoid harm which would ensue from circumstances in which he/she or another are placed. Duress operates as an excuse but necessity operates as a justification, rendering the defendant's conduct lawful. Necessity is a defence that argues "I desperately needed to do X, because consequence Y would have been really bad." Logically, this is identical to the concept of "duress of circumstance", where the situation rather than a person is the threat. The common elements are (1) an act is done to prevent a greater evil (2) the evil must be directed to the defendant or someone for who he is responsible (3) the act must have been a proportionate response. But only necessity is a potential defence for murder. The defence of necessity was first tested in the 19th century English case of R v Dudley and Stephens. The Mignotte, sailing from Southampton to Sydney, sank. Three crew members and a cabin boy were stranded on a raft. They were starving and the cabin boy close to death. Driven to extreme hunger, the crew killed and ate the cabin boy. The crew survived and were rescued, but put on trial for murder. They argued it was necessary to kill the cabin boy to preserve their own lives. Lord Coleridge, expressing immense disapproval, ruled, "to preserve one's life is generally speaking a duty, but it may be the plainest and the highest duty to sacrifice it." The men were sentenced to hang, but public opinion, especially among seafarers, was outraged and overwhelmingly supportive of the crew's right to preserve their own lives. In the end, the Crown commuted their sentences to six months. Since then, in the 1970s, in several road traffic cases, although obiter dicta, it has been stated that there is a defence of necessity. In Johnson v Phillips , Justice Wein stated that a police constable would be entitled to direct motorists to disobey road traffic regulations if this was reasonably necessary for the protection of life or property. In a later case, Woods v Richards, Justice Eveleigh stated that the defence of necessity depended on the degree of emergency which existed or the alternative danger to be averted. In DPP v Harris a police officer, charged with driving without due care and attention through a red traffic light contrary to s 3 of the Road Traffic Act 1988, and having collided with another vehicle containing armed robbers whilst pursuing that vehicle, was not allowed to advance the defence of necessity. Again in Chicon v DPP  the defence of necessity was not allowed in a case of a pit bull terrier dog being kept in a public place without a muzzle - the owner had removed the muzzle to allow the dog to drink. But in the case of In re F (Mental Patient Sterilization), the defence of necessity was allowed. In the case of R v Bournewood Community and Mental Health NHS Trust, the defence of necessity (in the case of Tort law) was recognized and applied by the House of Lords to justify the informal detention and treatment of a mentally incompetent person who had become a danger to himself. This approach was subsequently found to be a violation of Article 5 of the European Convention of Human Rights by the European Court of Human Rights in HL v United Kingdom. Subsequent to this decision, individuals who lack capacity must be deprived of their liberty in accordance with the Deprivation of Liberty Safeguards (an amendment to the Mental Capacity Act 2005), not under the common law doctrine of necessity. But more recently, duress of circumstance and necessity have been recognized and used by courts. In a leading case, Re A (Conjoined Twins), conjoined twins were born, one reliant on the other for her heart and lungs. Unless they were separated, both would die, but if separated, the reliant twin would die, the doctors therefore being liable to prosecution for murder. It was, however, held that in this special and incredibly sensitive situation, that the separation was necessary to save the first twin's life. The Criminal Justice Act 1948, section 13. Only applied to felony. The Criminal Law Act 1967, section 7(3). Only applied where no enactment specified a maximum fine. The Powers of Criminal Courts Act 1973, section 30(1). Amended by the Crime (Sentences) Act 1997, section 55 and Schedule 4, paragraph 8(3). The Criminal Law Act 1977, Schedule 13 repealed "limiting the amount of the amount of the fine that may be imposed or" and see section 32(1) (removed all statutory limits on fines imposed on convictions on indictment). Repealed in part by the Criminal Justice Act 1991, Schedule 13. The Powers of Criminal Courts (Sentencing) Act 2000, section 127. ^ Ormerod, David. Smith and Hogan's Criminal Law. Thirteenth Edition. Oxford University Press. 2011. pp. vii and 3. ^ R v Stone and Dobinson  QB 354, where an ill tended sister named Fanny couldn't leave bed, was not cared for at all and literally rotted in her own filth. This is gross negligence manslaughter. ^ R v Instan (1893) 1 QB 450, where a bedridden aunt, ostensibly in her niece's care developed gangrene, a "slur on justice" were it not punishable. ^ e.g. R v Pagett  Crim LR 393, where 'but for' the defendant using his pregnant girlfriend for a human shield from police fire, she would not have died. Note, Pagget's conduct foreseeably procured the heavy police response. ^ R v Kimsey  Crim LR 35, where 2 girls were racing their cars dangerously and crashed. One died, but the other was found slightly at fault for her death and convicted. ^ e.g. R v Blaue  where a Jehovah's witness (who refuse blood transfusions on religious grounds) was stabbed and without accepting life saving treatment died. ^ e.g. R v Williams  where a hitchhiker who jumped from a car and died, apparently because the driver tried to steal his wallet, was a "daft" intervening act. cf R v Roberts  Crim LR 27, where a girl jumped from a speeding car to avoid sexual advances and was injured and R v Majoram  Crim LR 372 where thugs kicked in the victims door scared him to jumping from the window. These actions were foreseeable, creating liability for injuries. ^ per Beldam LJ, R v Cheshire  3 All ER 670; see also, R v Jordan  40 Cr App R 152, where a stab victim recovering well in hospital was given an antibiotic. The victim was allergic, but he was given it the next day too, and died. The hospital's actions intervened and absolved the defendant. ^ R v Smith  2 QB 35, the stab was still an "operating" and "substantial" cause of death. ^ overturning R v Nedrick  1 WLR 1025, whose guidelines for the jury were to be certain " that death or serious bodily harm was a virtual certainty (barring some unforeseen intervention) as a result of the defendant's actions and  that the defendant appreciated that such was the case." Here the defendant poured paraffin through the letter box owned by a woman he didn't like and lit it. A child died in the fire. He was convicted of manslaughter. ^ e.g. in the U.K. Criminal Procedure (Insanity and Unfitness to Plead) Act 1991, giving the judge discretion to impose hospitalization, guardianship, supervision and treatment or discharge. ^ R v Clarke  1 All ER 219, caused by diabetes and depression, but the lady pleaded guilty because she did not want to defend herself as insane. Her conviction was later quashed. ^ R v Hennessy  2 All ER 9; though see R v Quick  QB 910 and the automatism defence. ^ Mr Windle was not hanged! ^ R v Bailey  2 All ER 503, a diabetic who did not eat enough after taking his dose of insulin hit someone with an iron bar. He was still convicted because automatism did not exist on the facts. ^ DPP v Majewski 1977 AC 433, where M was drunk and drugged and attacked people in a pub. He had no defence to assault occasioning actual bodily harm. ^ cf DPP for Northern Ireland v Lynch  1 All ER 913, the old English rule whereby duress was available for a secondary party to murder; see now R v Howe  1 AC 417, where the defendant helped torture, sexually abuse and strangling. Being threatened into helping was no defence. ^ R v Gill , where someone told to steal a lorry could have raised the alarm; see also R v Hudson and Taylor  where two teenage girls were scared into perjuring, and not convicted because their age was relevant and police protection not always seen to be safe. ^ e.g. R v Cairns  EWCA Crim 468 where a perceived threat of men running at car (when they wanted to help) was held acceptable as duress of circumstance, when one man was run over. Farmer, Lindsay (2000). "Reconstructing the English Codification Debate: The Criminal Law Commissioners, 1833-45". Law and History Review. 18 (2). Archived from the original on 2007-08-11. Wikimedia Commons has media related to Criminal law of the United Kingdom. This page was last edited on 24 February 2019, at 22:49 (UTC).